On July 6 Jabhat al-Nusra captured Al-Safa Hill in the Rankous Barrens . The rebel group launched an attack on Hezbollah, at the Al-Safa barrier, seizing two tanks and ‘57mm cannon. ’ Later in the day, pro-Government sources announced that all lost territory had been regained in Al-Safa. On the Midaa front, Jaish al-Islam claimed to have destroyed ‘several’ SAA armored vehicles in Eastern Ghouta . Dozens of fighters on both sides were reported dead . By the afternoon, pro-Government sources officially denied the statements made by Islamist groups. Footage was released showing government tanks storming suspected rebel-held positions in Daraya, Damascus. The SAA began July 6 with two kilometers separting their position in al-Mallah, from the Castello Road . 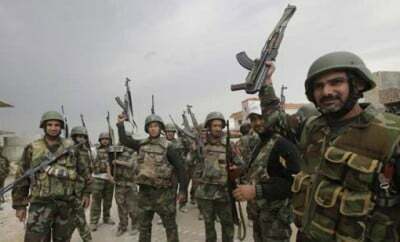 After securing the farms and blocking the road around midday, the SAA engaged rebel forces in the afternoon. Now, the road is under the SAA fire control and the joint force of Al Nusra, Nour al Dein al Zenki, Levant Front, Jaysh al-Fateh and the Free Syrian Army are attempting to re-open it. Militants are deploying massive reinforcements from the Idlib area. Pro-rebel sources say that up to 40 000 militants will be engaged in the battle for Aleppo.